On the Texas-Arkansas border in Bowie County, Texas and Miller County, Arkansas sits Texarkana, a city with one history but two identities. Texarkana was established in 1874 at the site of the junction of the Cairo and Fulton Railroad, which crossed through Arkansas, and the Texas and Pacific Railway, which ran east-west through Texas. Around the turn of the century, both the Arkansas and Texas sides of Texarkana installed water, gas, and electrical facilities as industry sprung up on both sides of the state line. Until the Great Depression, jobs with the railroads or in the agricultural processing industries attracted individuals to Texarkana. The Jewish community in Texarkana formed shortly after the city’s founding in 1874 and has proven instrumental in the town's development and growth. While only bits of information are known about the organization of Texarkana’s earliest Jews, a synagogue was quickly founded, creating a physical Jewish presence in a growing city. In the last quarter of the 19th century, Jews began to settle in the newly formed Texarkana. Most of them were immigrant merchants, usually selling dry goods and clothing. Abram Erber and Abram Goldberg, both born in Poland, and Russian-immigrant Solomon Davidson owned dry goods stores. Abraham J. Hoffman, born in Austria, was a clothes merchant and by 1883, Marks Kosminsky, born in Russia, owned and ran a general store with his brother Joseph. Joseph Deutschmann, who was born in Poland, helped the development of water and gas companies in Texarkana, owned a stake in the city’s first streetcars, and worked in real estate, developing housing in the growing town. When a flood in 1874 destroyed an African American residential area he had built, Deutschmann constructed “Deutschmann’s Canal” which drained the flooded area and still bears his name. Other prominent early Jews were clothing merchant Sam Heilbron, bankers Joseph Marx and Leon Rosenberg, Confederate Army veteran Bero Berlinger, and café owner Martin Levy. Upon visiting Texarkana in 1879, Jewish newspaper editor Charles Wessolowsky found ten Jewish families, around 75 people, who had little organization and a curious situation regarding their spiritual leadership. Reverend Charles Goldberg, pastor of a local church, was trained as a rabbi in Germany but became an ordained minister after falling ill and being nursed back to health by a Presbyterian family in Missouri in the 1840s. Without a qualified leader for the 1876 High Holiday services, Texarkana’s Jews asked Reverend Goldberg to officiate. Goldberg must have continued performing the High Holiday services through the late 1870s as, in 1879, Wessolowsky described Goldberg as a “hypocrite” with “hidden selfish motives,” though Goldberg never attempted to convert Texarkana’s Jews to Christianity. On his deathbed, Goldberg asked for a rabbi and even requested that he be buried in the Jewish cemetery. Other than the High Holiday services conducted by Reverend Goldberg and reported by Wessolowsky, the early record of Jewish celebrations is sparse--Texarkana’s newspaper records only date back to 1884. The earliest documented High Holiday services in Texarkana were held in 1885, though services most likely took place through the early 1880s as well, probably in Kosminsky Hall, the Masonic Hall built above one of Marks Kosminsky’s store houses. Services in 1885 were presided over by Rabbi Friedman of Camden, Arkansas with help from Marks Kosminsky. That year the Daily Texarkana Independent wrote: “Tomorrow is the Jewish New Year, and all our citizens of that faith will close their business houses from 6 o’clock this evening until 6pm tomorrow.” Mount Sinai Congregation was most likely formed around 1885 and Mt. Sinai Memorial Park, a Jewish cemetery, was likely purchased that same year. An April, 1885 newspaper announced monthly meetings of the Texarkana Hebrew Benevolent Association in Kosminsky Hall, with Joseph Deutschmann serving as president. By July, 1886, meetings were held twice a month. In 1888, the women of the community established the Ladies Hebrew Benevolent Society, which gave charity to those in need and maintained the cemetery. In 1900, the society had 21 members. Later, the group became the Mt. Sinai Sisterhood and remained extremely active in the congregation for years to come. 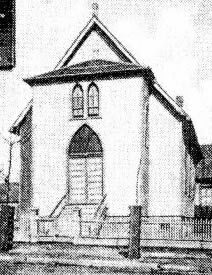 After Mount Sinai Congregation was founded, its president Joseph Deutschmann sought to acquire a synagogue building. An Episcopal Church was for sale and Deutschmann, with the help of his non-Jewish friend Fred Offenhauser, purchased it, had it moved to Eighth Street and State Line Avenue on the Arkansas side of Texarkana, and remodeled it into a synagogue. Tragedy struck in 1892 as a grocery store adjacent to the synagogue caught fire and the congregation’s new home burned down. However, thanks to the leadership of Deutschmann, a new synagogue was dedicated in 1894, built at Fourth and Walnut Streets in Arkansas. In October, 1893, Mt. Sinai’s thirty members adopted a constitution for the congregation. Around the same time, the congregation hired its first rabbi, A. Shriber. By 1900, a Rabbi Kaiser led the congregation. In the early 20th century, as the city’s population swelled from 14,000 in 1896 to around 21,000 in 1925, Mt. Sinai’s membership grew as well, reaching 50 households by 1917. With its English name and use of English prayers, Mt. Sinai Congregation was Reform from its founding, though it did not consistently affiliate with the Reform Movement. In 1907, Mt. Sinai belonged to the Union of American Hebrew Congregations, though this membership was short-lived. Most likely, the congregation’s decision to disaffiliate was due to economic rather than ideological reasons. Finally, in 1939 Mt. Sinai officially rejoined the UAHC. While some of Texarkana’s Jews were Orthodox in their traditions, their numbers were too small to form a separate congregation so they held their own separate Orthodox minyan early on Saturday mornings. Since the Orthodox group was so small, some Reform members would attend the traditional service to help them have the ten men required for a minyan. By the 1940s, this Orthodox group had dwindled and the separate services were discontinued. In addition to Mt. 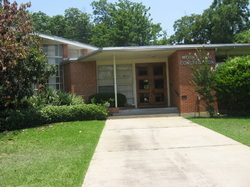 Sinai Congregation, Texarkana Jews established other Jewish organizations. In 1901, they founded a B’nai B’rith Lodge for men; in 1947, Jewish women in Texarkana started a chapter of B’nai B’rith Women. Other early 20th century Jewish organizations in Texarkana include a Zionist association, founded in 1917, and the Jewish Charity Chest, founded in 1931 to help those in need during the Great Depression. Texarkana’s Jews became important leaders in the local business community as Jewish-owned businesses proliferated on East and West Broad Street in downtown Texarkana. Many Jews, such as Adolph and Morris Sandberger and Isaac Schwartz, ran dry goods stores. Others, such as Gus Zimmerman, Sol Danziger, Benjamin Fane, and Jacob, Julius, and Max Scherer worked in the clothing industry either as tailors or retailers. Other Jewish-owned businesses included Heilbron Jewelry, run by Ray Heilbron, and Texarkana Casket Co., owned by Leo Krouse. A few Texarkana Jews were professionals; both Leonce Kosminsky, son of Marks, and Nettie Marx Klein were physicians. The Jews of Texarkana matched their involvement in business with civic service on behalf of their city. Leo Krouse, born in the Austria-Hungary, served as Mt. Sinai president, president of the Board of Trade, and ran war relief fundraising efforts during World War I. Simon and Harry Ehrlich owned many theatres throughout the southwest, including the Grand Opera House in Texarkana. The brothers were noted for their philanthropy, hosting a fundraiser for the Jewish cemetery at the Grand Opera House in 1911. Simon and Harry were especially supportive of needy children in Texarkana. Nettie Marx Klein was one of the first female physicians in Texas and was president of the Bowie County Medical Association. East Prussia native and Spanish-American War veteran Louis Josephs was a successful local attorney. Joseph was elected to represent Miller County in the state legislature three times, beginning in 1913; later, he served as a Texarkana Municipal Court judge from 1925 to 1935. Blessed with a strong membership base in the 1930s, Mt. Sinai Congregation decided that it needed to enlarge its current synagogue. Even though the temple had been renovated in 1930, a larger facility was now necessary to house the growing congregation which had 40 families in 1940. Despite Jews’ success as businesspeople in Texarkana, the Great Depression made fundraising difficult. However, thanks to the zeal and generosity of Simon Ehrlich, the Ehrlich Education Building was completed and dedicated in 1935, the year of Mt. 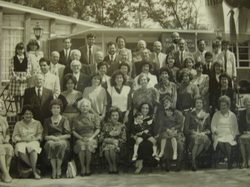 Sinai’s 50th anniversary. This new addition was well-timed. As the world plunged into World War II, Texarkana’s economy thrived thanks to the construction of the Lone Star Army Ammunition Plant and the Red River Army Depot, both located just a few miles from the city. Hundreds of service men and women were now stationed in or near Texarkana and the members of Mt. Sinai provided a Jewish connection for the Jewish soldiers. Thanks to the Jewish Welfare Board, some congregants were able to host soldiers for High Holiday or shabbat meals, and many soldiers, both Jewish and non-Jewish, attended Friday night services and the social hour which followed. Mt. Sinai also held Passover Seders and various social events for the soldiers at the temple. Thanks to the romantic involvement between soldiers and local Jewish young women, some servicemen eventually settled down with their new wives in Texarkana. Following World War II, Mt. Sinai, which had around 50 households, decided to construct a new synagogue. The old building was sold in 1946, but since the new synagogue would not be completed until 1949, the congregation met in the Miller County Courthouse on Friday nights. In a display of the warm relationship between Mt. Sinai and Texarkana’s churches, the congregation held high holiday services at the Congregational Church while their new synagogue was being built. In April, 1948 the congregation adopted a new constitution. The following year, they dedicated their new building, now located on the Texas side of the city, with a ceremony of “beauty, dignity and prayer” according to the Texarkana Gazette. Attendees were addressed by various Jewish community leaders as well as Reverend Chauncey V. Farrell, president of the Texarkana Ministerial Alliance. The new synagogue featured a social hall, kitchen, rabbi’s study, Sunday school classroom, and a sanctuary seating 90 people. Mt. Sinai initially thrived in the post-war era. By 1952, 40,490 people lived in Texarkana, and in the 1940s and 1950s many Jews chose to make Texarkana their new home. Among the new arrivals were Leo and Madelyn Walkow, who owned a dress shop. Both Leo and Madelyn were active in the congregation, serving on the temple and sisterhood boards. Leo prepared many of the synagogue’s youths for their b'nei mitzvah and in 1981 the social hall was renamed the Leo A. Walkow Hall in honor of his service to the congregation. The congregation also drew members from the small towns surrounding Texarkana. Jake and Hannah Meyers lived in Ashdown, Arkansas, while Ellen and Henry Kaufman lived in Atlanta, Texas. Perhaps the most significant arrival to Mt. 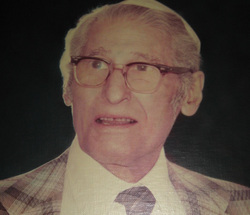 Sinai in the mid-20th century was Rabbi Joseph Levine. Until the late 1950s, Mt. Sinai was led by a variety of rabbis, the longest serving of whom were Joseph Bogen (1900-1906), Rudolph Farber (1915-1922), David Alpert (1930-1935), and Moses Landau (1946-1950). However, from 1958 until 1981, Rabbi Levine, a native of McKeesport, Pennsylvania, held the pulpit in Texarkana. An excellent speaker and lover of American history, Rabbi Levine was much beloved by his congregants and the greater Texarkana community. With its spiritual leadership in place, Mt. Sinai undertook a few physical improvements to its temple. Three additional Sunday school rooms were added in 1956 and, thanks to the Sisterhood, the building was outfitted with air conditioning in 1959. The cemetery was refurbished as well and Mt. Sinai Cemetery was renamed Mt. Sinai Memorial Park in 1974. Mt. Sinai Cemetery Perpetual Care Trust was established to fund the cemetery’s maintenance though vandals damaged 27 monuments in 1980. From its 75th anniversary in 1960 through the late 1980s, Mt. Sinai’s membership numbered approximately 40 households. Many children raised in Texarkana chose to move to bigger cities after college while some members, including the Walkows, Zimmermans, and Wexlers, moved away as well. Luckily, new members arrived in the 1970s, keeping the synagogue’s membership numbers level. A decline in membership, however, soon set in as the number of new arrivals dwindled. In 2011, Mt. Sinai’s membership was only 35 individuals, and in 2015, the temple closed. Whether located in Texas or Arkansas, Mt. Sinai was a significant part of Texarkana almost since the city’s inception. While the heyday of the synagogue was in the 1940s and 1950s, Mt. Sinai’s congregants always contributed, commercially and civically, to Texarkana’s development. The Jews of this unique city managed to maintain a strong commitment to both their faith and community.